Infiniti QX60: Three rows seat seven people, luxury appointments, technical innovation, eye-catching style, great features, not a minivan. The 2014 infiniti qx60 electric vehicle qualifies for a federal tax credit of up to $7,500, effectively reducing the net base price. There are certainly lots of crossover sport-utility vehicles but not so many in the luxury end of the market. With the 2014 QX60, Infiniti enters a segment where the competitors are relatively few but admittedly strong, with some of the main players being the Acura MDX and Audi Q7. It’s a place where buyers need room for people and cargo, with a healthy dose of luxury in both appointments and image, but absolutely don’t want the stigma of “ minivan.” The QX60 offers generous levels of safety, technology, convenience, innovation and luxury, presented in a sleek and eye-grabbing style. In the market for a roomy and convenient 3-row, 7-seat crossover SUV with great looks, lots of safety features and other amenities, up-to-the-minute technology, impressive luxury and high style? Your shopping list should include the QX60. Maybe you’d really rather have a more conventional SUV, something that’s been around for a while. Maybe you need to tow a large trailer. You probably need something else. There are two major changes for 2014. First, the name QX60 is new. In Infiniti’s re-aligning of the product line’s alpha-numeric designations, this is last year’s JX35. More important, the QX60 line adds a hybrid, which promises impressive fuel efficiency to go with its already-exceptional capabilities. Drivers will like the way the QX60 accelerates up to speed sprightly, steers around corners responsively and generally deals with the world’s driving situations much better than would be expected. Not overly strong, the 3.5-liter, 265-horsepower V6 engine, matched with a continuously-variable automatic transmission (CVT), is both willing and smooth. If not tire-smoking fast, the QX60 delivers commendable fuel economy. EPA ratings for the front-wheel-drive version are 20 mpg city, 26 highway, while the all-wheel-drive model, with its all-weather capabilities, is rated at 19 city, 25 highway. If even more fuel economy is your goal, the QX60 Hybrid, with its supercharged 4-cylinder engine and 15kW electric motor deliver 250 net horsepower and 26 mpg combined with a total driving range of well over 500 miles, and it’s also available with either front-drive or all-wheel drive. And, since the Hybrid’s combined power output closely matches that of the gasoline V6, the performance differences between the two versions should be negligible. The QX60 Hybrid uses a 2.5-liter supercharged 4-cylinder engine in combination with a 15kW electric motor connected to a CVT for a net system output of 250 horsepower, and without any reduction in passenger or cargo space. Its combined fuel economy is projected at 26 mpg. While some form of intelligent cruise control isn’t all that rare on today’s luxury vehicles, the Distance Control Assist function is. In the Infiniti JX, it prompts the driver to release the throttle and applies the brakes in slowing traffic even if the driver is not paying as much attention as he or she should be. The QX60 interior is a 3-row crossover SUV that actually welcomes all seven passengers. The second row adjusts fore and aft to allow the proper mix of legroom and cargo-carrying capacity, and makes it uncommonly easy to access the third row. You can even enter the rear-most row with a child safety seat already attached in the second row, which is nearly impossible in other luxury 3-row SUVs. There is no skimping on luxury electronics either. The 15-speaker Bose Cabin Surround Sound system is accompanied by the Infiniti Connection telematics system that syncs to the driver’s schedule via Google Calendar. The QX60 Hybrid uses a compact Lithium-ion battery located under the 3rd-row seat, thus maintaining a flat floor for ease of passenger access and no loss of cargo space. The 2014 QX60’s sleek, distinctive exterior might very likely make the discovery of the large and comfortable interior a surprise – how did they fit so much space inside such an eye-catching shape? Still, there it is. It’s appealing and modern without looking as if it will go out of style in the next five minutes, and that sleek outside also hides a flat floor that contributes to a lot of the roominess found in the second and third rows. The QX60 might not qualify as vehicular art, but it is a good-looking item, with well-tailored lines and crisp detailing that will set it apart from the more common SUV configurations. As an Infiniti, even a “base” QX60 is extremely well-equipped. Among the key standard mechanical items is the sport-tuned continuously-variable transmission with manual-shift mode and Sport mode, which mimics a step transmission, and the Infiniti Drive Mode Selector that offers standard, sport, snow and “eco” settings that alter throttle response and transmission mapping based on conditions. The 2014 QX60 is full of electronic driver aids. The Lane Departure Warning and Lane Departure Prevention systems use a camera behind the windshield to detect lane markers, warning you if you are in danger of an unintended lane departure. If you don’t heed the warnings, the system guides you back in your lane with a gentle application of the brakes on the opposite side of the drift. The QX60 also can be equipped with a Blind Spot Warning system, Blind Spot Intervention, Intelligent Cruise Control and Distance Control Assist. With all these systems, plus Intelligent Brake Assist with Forward Collision Warning, you might get the impression that the 2014 Infiniti QX60 will essentially drive itself. The “base” 2014 QX60 is powered with a smooth, responsive and proven 3.5-liter V6 with the CVT automatic. This engine has more than enough power to accelerate with any reasonably normal traffic, on city streets or interstate highways and, for more enthusiastic driving, the CVT has a “gear-type” simulation mode. Alternately, there’s the QX60 Hybrid, a 2.5-liter supercharged 4-cylinder that, in combination with a 15kW electric motor, has a net power system output of 250 horsepower. It, too, is fitted with a continuously-variable transmission. The Hybrid uses Infiniti’s Direct Response Hybrid system with a compact Lithium-ion battery and an Intelligent Regenerative Braking system that partially recharges the battery during vehicle braking. The 2014 Infiniti QX60 has a Manufacturer’s Suggested Retail Price (MSRP) a little above $41,000 for the front-drive version, with the all-wheel drive adding about $1,400. The Hybrid will be about $3,000 above either version. The options will add measurably, however, with the Premium Equipment Package around $5,000, the Technology Package around $3,100 and the Theater Package around $1,700. 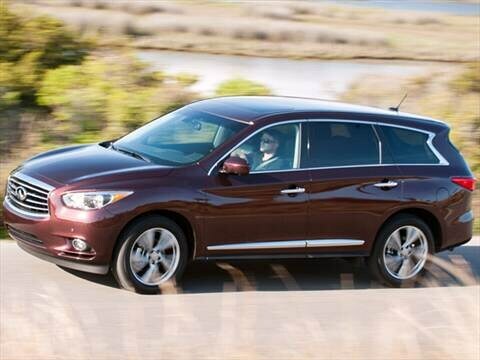 A fully-loaded QX60 will cost well over $50,000. Be sure and check the Kelley Blue Book Fair Purchase Price to see what others in your area are actually paying for the QX60. The good news is that the Infiniti QX60 is expected to deliver strong residual values, slightly better than the Acura MDX, but slightly below the Audi Q7. Best family luxury vehicle on the market! Great vehicle would do it again. Great value, best purchase Ive made! Great family vehicle, lots of room, great ride. I have 5 grand kids ranging from age 9-19. Plenty of room for us all. Overall really good quality and driving dynamics. My husband and I have owned many luxury cars and this one is up there with my favorite!